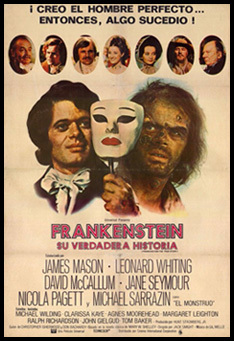 Since James Whale’s adaptation of Frankenstein (1931), Mary Shelley’s classic 1818 novel of the scientist who creates life and pays dearly for it has been brought to the big screen countless times, most notably by Universal Studios and Hammer Film Productions. 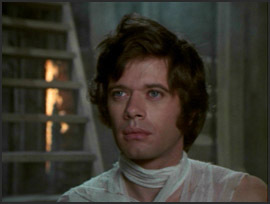 By the early 70’s, gothic horror had begun to lose ground to more contemporary and familiar settings, but nevertheless, an ambitious two-part miniseries directed by Jack Smight aired on television in 1973: Frankenstein: The True Story. 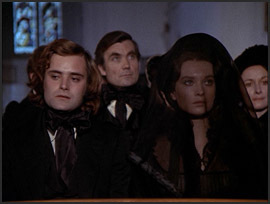 The cast is a distinguished one: James Mason as Dr. Polidori, Michael Sarrazin as the Creature, David McCallum as Henry Clerval, Nicola Pagett as Elisabeth Fanshawe, Jane Seymour as Agatha/Prima, and a handsome young Leonard Whiting as Victor Frankenstein. 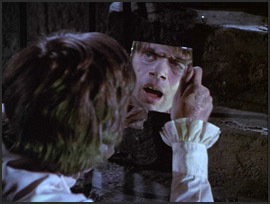 When he loses his brother in a boating accident, young Victor Frankenstein becomes disenchanted with God, swearing that he would gladly become the pupil of Satan if that would give him the power to imbue his brother’s corpse with life. He resolves to continue his medical studies in London, leaving his fiancée/foster sister, Elizabeth Fanshawe, with her parents. On his way, his comes upon a man with an injured arm, whom he takes to the hospital in his carriage. There, he treats the man with the aid of fellow doctor, Henry Clerval. They decide to amputate, and unbeknownst to Victor, Clerval keeps the severed arm, which he treats with a solution that is able to keep it alive. Clerval later makes Victor privy to his techniques and theories, and the two complete the construction of a secret laboratory of Clervals’. When several young men are killed in a mining accident, Clerval and Victor, who have access to the cadavers, select the best body parts from each and piece together a subject for reanimation. While the two are impressed with the completed body, they agree that it is a pity that their physically flawless man will have the brain of a peasant. The night before the scheduled reanimation attempt, Clerval discovers that the reanimated arm has degenerated into a misshapen form. He then suffers a heart attack before being able to make an entry of the undesirable development. 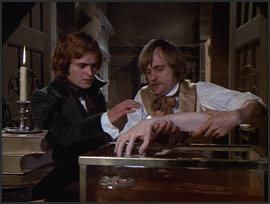 When Victor finds Clerval dead at the laboratory, he decides to transplant Clerval’s brain to the assembled body. He completes the experiment, bringing to life a creature that is not only beautiful and strong, but also quite intelligent. Frankenstein takes it upon him to educate his creation, and after having brought it to an operatic performance, decides that it is ready to be introduced into society. However, when he discovers the still living but unsightly arm, he realizes that the process which had kept it alive is reversing itself. He then notices that the creature is also showing signs of the same degeneration. Victor removes all mirrors from his room at the boardinghouse and, when the sight of the now quite grotesque creature causes his landlady to die of fright, he retreats with the creature to his laboratory. There, the creature finally sees its own reflection. Weeping, it pleads Victor for help, but the defeated surgeon merely stares blankly. Rejected, the creature attempts suicide by stabbing itself. When this fails, it runs to the ocean cliffs. Victor catches up with it, but fails again to offer any consolation, letting the creature throw itself into the crashing waves. The creature survives this second suicide attempt and is washed up on shore. It eventually befriends a blind, elderly man, taking care to stay out of sight of his granddaughter, Agatha. When she and her lover finally surprise the creature in her grandfather’s home, the result is disastrous. The young man attacks the creature, which inadvertently kills him in self-defense. 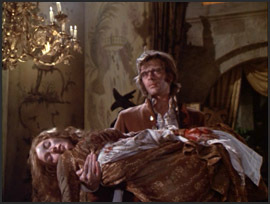 Agatha tries to run, and in her panic, she is fatally hit by a carriage. Devastated, the creature seizes her body and takes it to Frankenstein’s laboratory, only to find that Victor has abandoned it, and that it is now occupied by Clerval’s former teacher, Polidori. Polidori decides to use the situation to his own advantage: he takes the creature to Victor and uses it as leverage to get his help. Polidori’s hands were crippled when working with dangerous chemicals, and he now needs Victor’s skills as a surgeon to create an animate of his own. Victor, who has just recently married Elizabeth, reluctantly agrees, fearing the reaction if his creature is made public. Polidori explains how Clerval had cut corners in his reanimation process, which is why the creature has become physically deformed. With Victor’s help, he attaches Agatha’s head to another body and, applying a different technique than Clerval, creates the beautiful Prima. With Victor and Elizabeth on their honeymoon, Polidori insinuates himself into the Fanshawe home in preparation of Prima’s introduction into society. Victor is angered to find Polidori and Prima at the Fanshawe residence upon his return, but Polidori insists that he will not impose upon Victor for much longer. He even offers to help Victor deal with the creature. Polidori, a master hypnotist, places the creature under hypnosis next to a vat of acid with the intent of submerging it, but Victor awakens it at the last moment. As the creature throws one of Polidori’s attendants into the acid, Polidori and Victor escape, trapping the creature as the laboratory goes up in flames. Meanwhile, Elizabeth has grown suspicious of Prima, whom she catches trying to strangle a cat. Prima, however, charms everyone at a splendid party held to introduce her to society. She even performs a ballet routine, much to the amazement of her audience. Polidori explains to Victor that he intends to use Prima as a political pawn, that he will control her as she becomes the mistress of men in power. The festivities are cut short when the creature arrives. The two creations fight, with Victor’s creature emerging victorious as it rips Prima’s head from her body. The next day, Victor tries to confess his involvement to the police, but Elizabeth stops him and manages to convince them that Polidori is responsible. Victor and Elizabeth decide to set sail for a fresh start in America, but to their dismay, they find that Polidori is also a passenger on their ship, having used his powers of hypnosis to avoid imprisonment. Elizabeth later discovers that the creature is also on board as a stowaway. She manages to trap it with Polidori in his cabin, but Victor unlocks the cabin door. Polidori tries to escape, but the creature catches him and hoists him up one of the masts during a thunderstorm. Both Polidori and the creature are struck by lightning. The creature survives. Polidori doesn’t. In the commotion, Victor is knocked unconscious and the crew of the ship mans a lifeboat, leaving only Elizabeth, Victor, and the creature onboard. Elizabeth confronts the creature with the information of her pregnancy. “What have you to do with life, you thing of death,” she asks with undisguised contempt. When Victor awakes, he finds Elizabeth dead, strangled by the creature. He also finds that the ship is now locked in ice. He pursues the creature to a nearby cavern where he confronts it, and admits to his own feelings of guilt. Victor acknowledges that he will soon succumb to the harsh environment, but that the creature will live on. With a final cry for forgiveness, Victor inadvertently brings down an avalanche upon the two. A handsome period piece, Frankenstein: The True Story actually treats Mary Shelley’s themes and plot developments rather liberally. 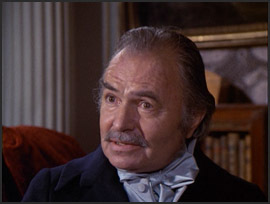 Certain details seem lifted from earlier adaptations, particularly those of Hammer Film Productions. 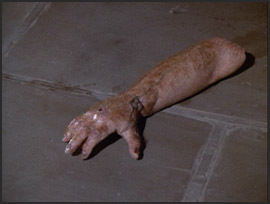 For instance, Polidori’s hands are crippled much like those of Victor Frankenstein in Frankenstein Created Woman (1967), while the young couple blackmailed by an older scientist has its equivalent in Frankenstein Must Be Destroyed! (1969). In this version, Victor Frankenstein is a surprisingly weak character. Though he is initially motivated by the death of his brother, he is caught up in the ambitions of two superior scientific intellects: Clerval (who was rewritten for this adaptation) and Polidori (who has no counterpart in Shelley’s novel). Frankenstein himself is no more than a highly skilled surgeon who allows himself to be manipulated by Clerval and blackmailed by Polidori. In that regard, one can argue that the hubris is not really his. He is merely a brilliant but shallow man who finds himself unable to deal with the consequences of his actions. When his creation becomes aesthetically displeasing, he rejects it emotionally. He considers it a failure, even though it remains gentle and surprisingly healthy in spite of the deterioration. When it attempts suicide, he does not stop it. Frankenstein’s real crime is that he is a bad father. By abandoning his responsibilities, he triggers the creature’s destructive behavior. Prima, the seemingly flawless female creation, is an interesting figure, hiding an absolute lack of empathy beneath a veneer of acquired politeness. At one point, she overhears a frustrated Elizabeth rehearsing at the piano, and is immediately able to accurately reenact the performance, right down to making the same mistakes. The scene illustrates Prima’s not quite human psychology: she can copy the music with mathematical precision, but she utterly fails to comprehend its purpose and meaning. Thus, she stands in contrast to the male creature, which, though physically imperfect, has the full range of human emotions, from joy and affection to vanity, despair, and vengefulness. Of course, in Shelley’s novel, Prima’s counterpart is never animated. Frankenstein creates her as a mate for his monster, but fearing that the union could lead to a whole race of monsters, he chooses to destroy her. Endearingly, the tired, old warning against “man playing God” is not delivered too heavy-handedly in The True Story. While it insists that science must be tempered with morality, the three scientists are not guilty of the same crime. Clerval is selfish at best, intending to take sole credit for the success of his and Victor’s project, and Polidori is a megalomaniac whose true goal is political power. 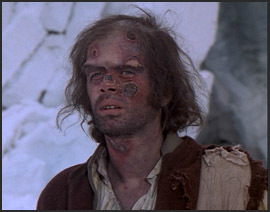 Victor Frankenstein, on the other hand, starts out with altruistic ambitions for his beautiful creature: “You who know nothing of greed or hatred, you shall teach us how to live.” When he is finally reconciled with the creature, he asks for forgiveness – not for giving it life, but for disowning it. Rather than being an affront to God, the creature initially embodies a childlike sense of innocence and wonder. Victor teaches it vanity, telling it that it is beautiful. He also teaches it that it is unworthy of love by rejecting it when its appearance mutates and becomes repelling. And even then, the deaths caused by the creature are forgivable because they are either accidental or the result of abuse (as in the case of Polidori). When the plot requires the most gruesome action of all, i.e. the killing of the pregnant Elizabeth, the creature’s personality is suddenly suppressed by that of Clerval. 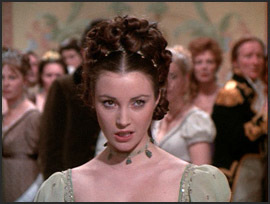 What the until then dormant Clerval had to gain by killing Elizabeth is not entirely clear, but this lazy bit of writing at least renders the creature guiltless of the deed. The True Story is best enjoyed not as a straight adaptation, but as a different take on the same idea. It is not without flaws. The dialogue is occasionally stilted, no effort is made to make the animation of the two creatures look like anything but cheap science fiction, and Polidori’s skills as a hypnotist are practically a super power (one actually wonders why he would need Prima when he himself can place people under hypnosis almost instantly). However, the themes of morality are explored in an engaging manner, and as a horror experience, it is satisfyingly gruesome. And for that, we can suspend our disbelief just a little.